There are no new trade or acquisition rumors to report. There are no transactions to report. The Cardinals annual Winter Warm-Up is scheduled for January 13-15 in St. Louis at the Hyatt Regency Hotel. The annual Baseball Writers’ Dinner is scheduled for Sunday evening the 14th at the Union Station Hotel in downtown St. Louis. Admission and autograph tickets for the Winter Warm-Up are on sale now either online at Cardinals.com or at the Busch Stadium Box Office. Admission tickets are $40 for the three day event. The annual Cardinals Caravan is scheduled in conjunction with the Winter Warm-Up. The Caravan will take place January 12-15 with six caravans scheduled. Caravans will traverse six states: Missouri, Illinois, Arkansas, Indiana, Kentucky, and Tennessee. Details can be found at https://www.mlb.com/cardinals/community/caravan . January brings arbitration season. The deadline for teams and arbitration eligible players to submit salary figures is January 13. Any arbitration hearings will be scheduled during the first several weeks of February. The Cardinals arbitration-eligible players are Michael Wacha, Tyler Lyons, Randal Grichuk, and the newly acquired Marcell Ozuna. This week’s blast from the past centers on the St. Louis Cardinals team from 1966. It was the 85th season for the franchise, and the 75th in the National League. 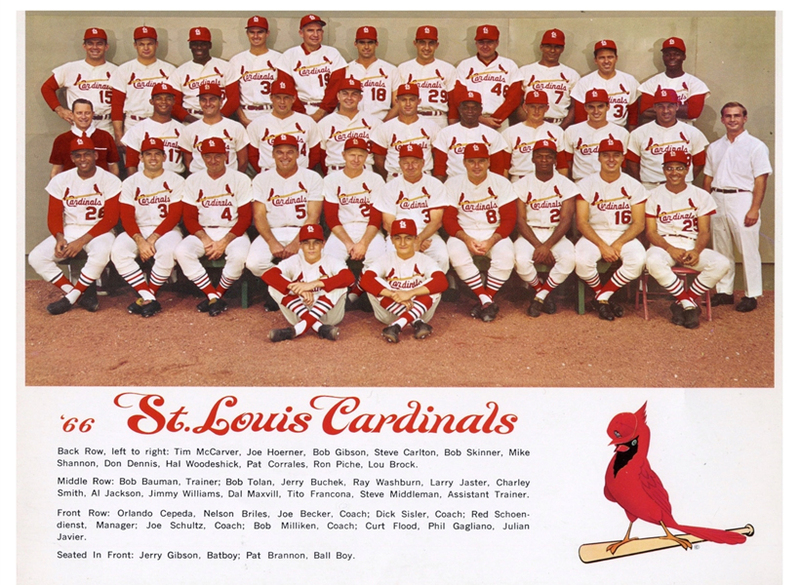 The 1966 Cardinals finished 83-79 and ended in sixth place in the National League. The manager was Red Schoendienst, the GM was Bob Howsam. The Cardinals were owned by Gussie Busch. The Opening Day lineup was Lou Brock (RF), Julian Javier (2B), Curt Flood (CF), Tim McCarver (C), Charley Smith (3B), Alex Johnson (LF), George Kernek (1B), Jerry Buchek (SS), Curt Simmons (P). The longest losing streak was eight games, from September 18-27. The longest winning streak was seven games, from September 10-17. The highest winning margin was an 11-5 defeat of the Pirates on June 8. The worst loss was a 15-2 drubbing from the Giants on May 7. Home/Road splits were 43-38 at home, and 40-41 on the road. 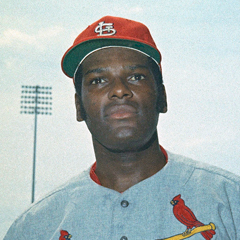 The top starting pitcher was Bob Gibson, who went 21-12 with an ERA of 2.44. The top offensive performances came from Orlando Cepeda and Mike Shannon. Cepeda hit .303/.362/.468 with 17 home runs and 58 RBI. Shannon had a slash line of .288/.339/.462, with 16 home runs and 64 RBI. Cepeda had been acquired in a trade from San Francisco in May for pitcher Ray Sadecki. 1966 marked the opening of Busch Stadium II. The Cardinals played the first five weeks of the season in the old ballpark, Busch Stadium I (aka Sportsman’s Park), before playing the first game in the new stadium on May 12 against the Atlanta Braves. In the summer of 1966, the Cardinals hosted the All-Star Game in the new Busch Stadium II. Gibson and center fielder Curt Flood both won Gold Gloves in 1966.